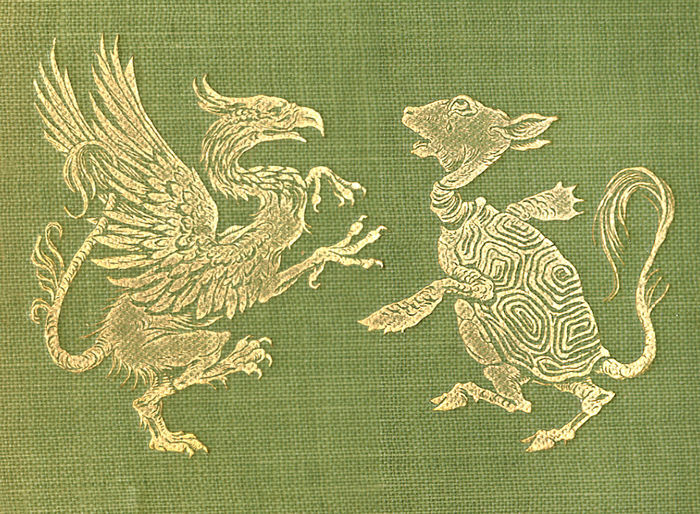 Publisher’s green cloth with gilt vignette and black lettering to upper board, black vignette and lettering to spine, publisher’s device to lower board, top edges green, pictorial endpapers (printed in green), 13 colour plates with descriptive tissue guards (captions in maroon), 3 full-page plus 11 smaller drawings, illustrated title page, decorative initials, xii, 162 pages plus advertisement, 21 x 15.2 cm. 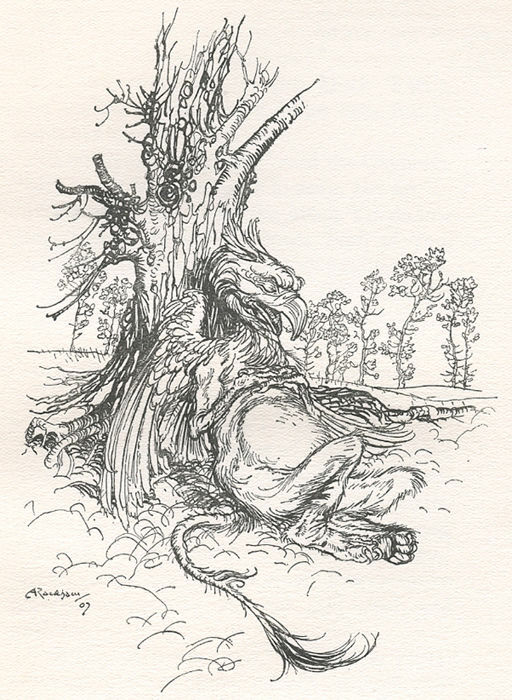 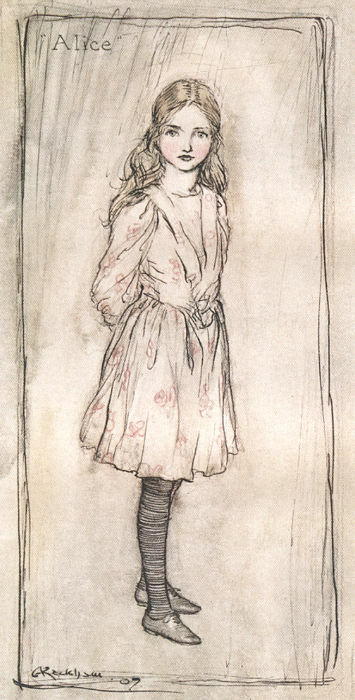 Undated, but 1907 (Riall p. 77; Lovett 215b). 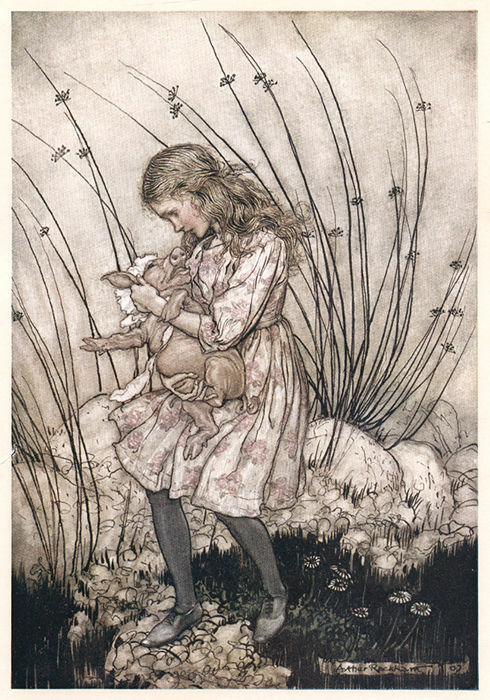 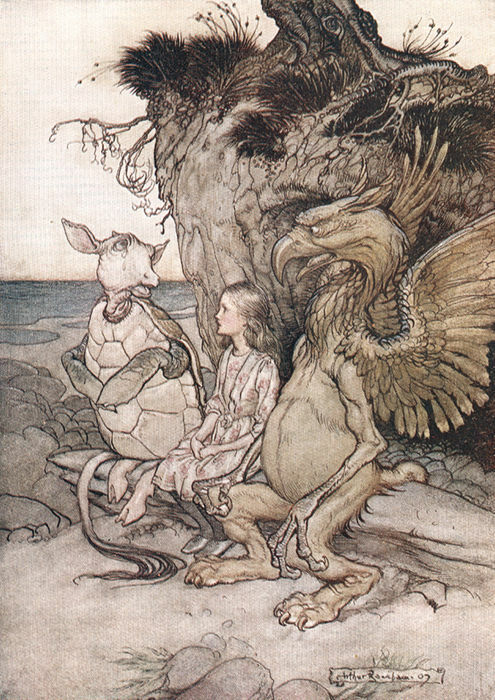 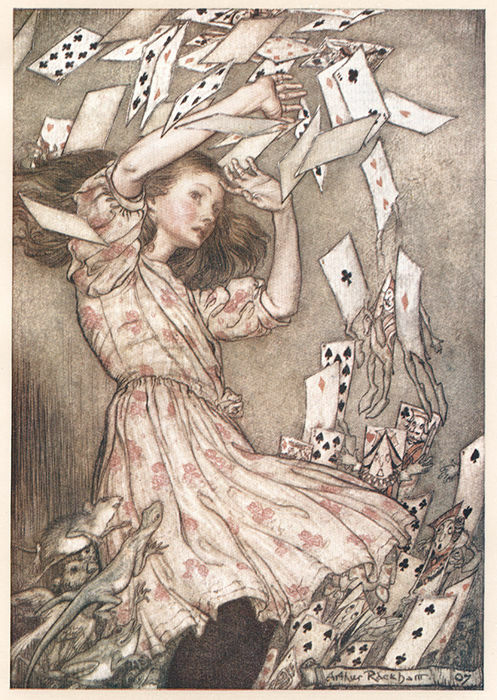 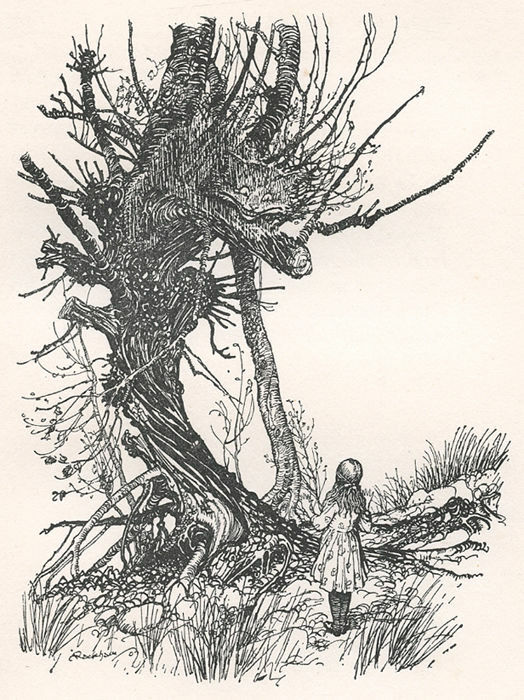 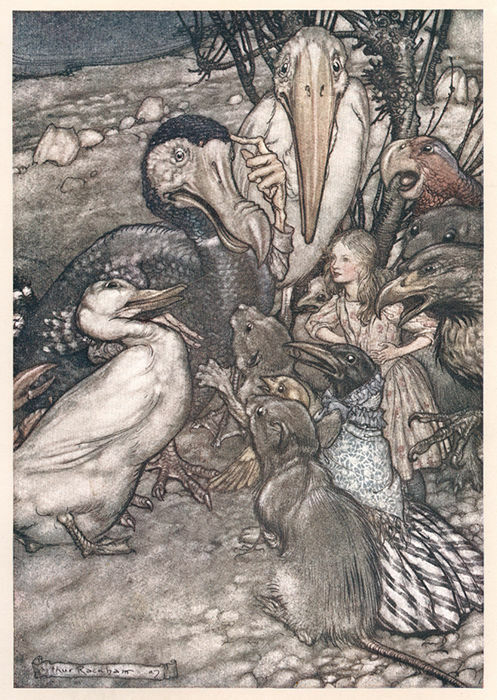 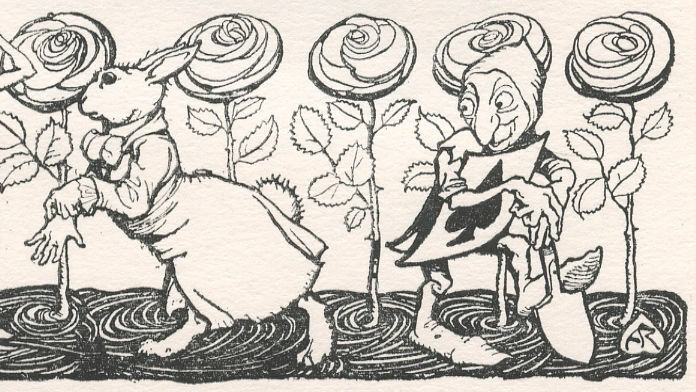 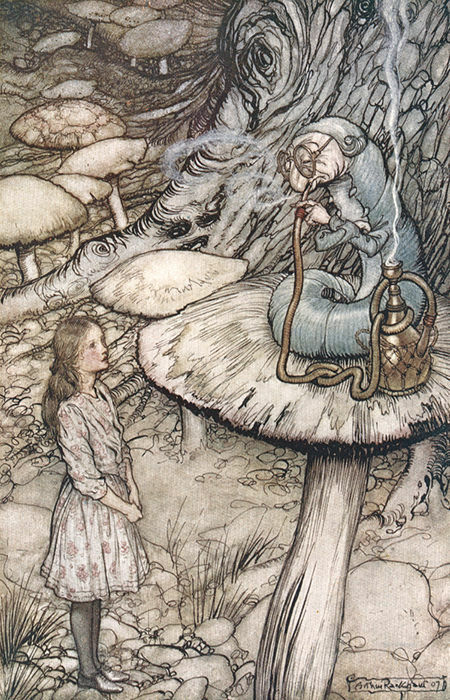 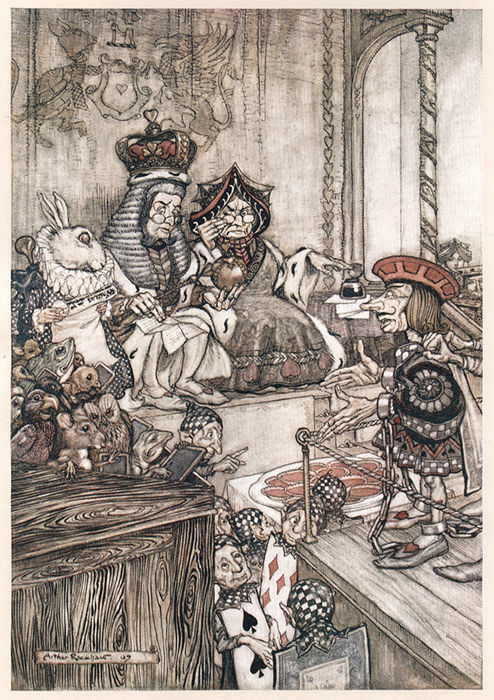 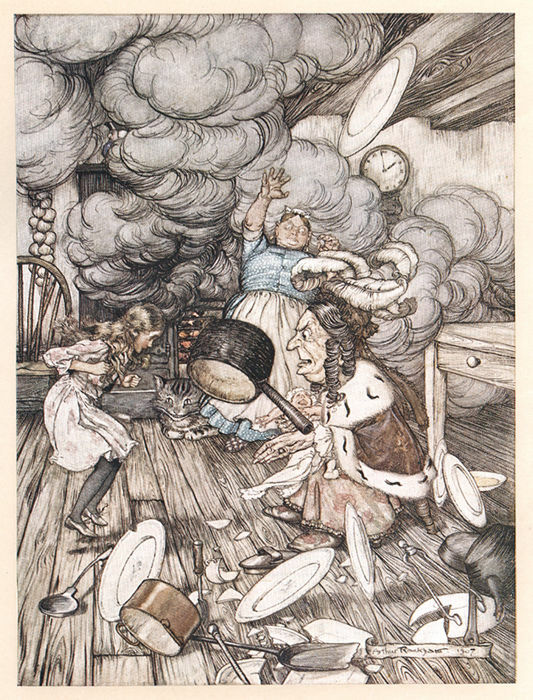 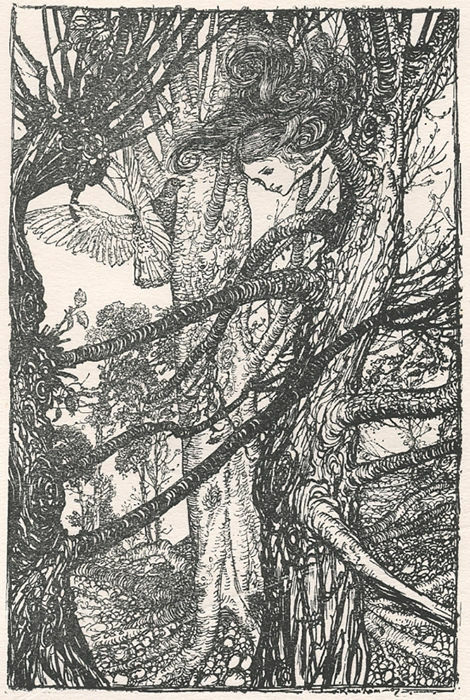 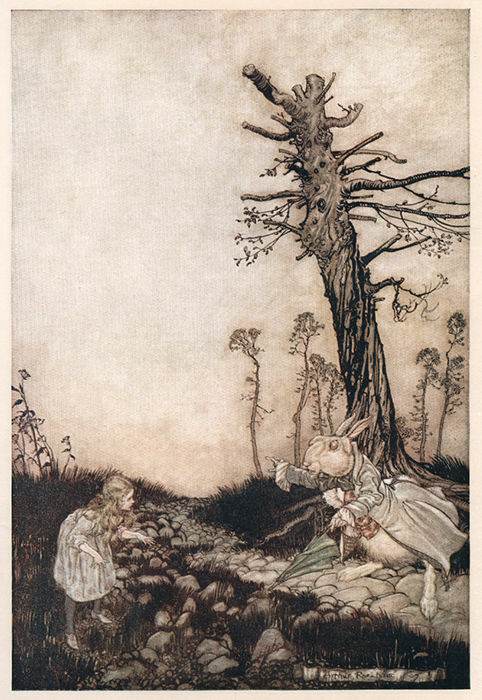 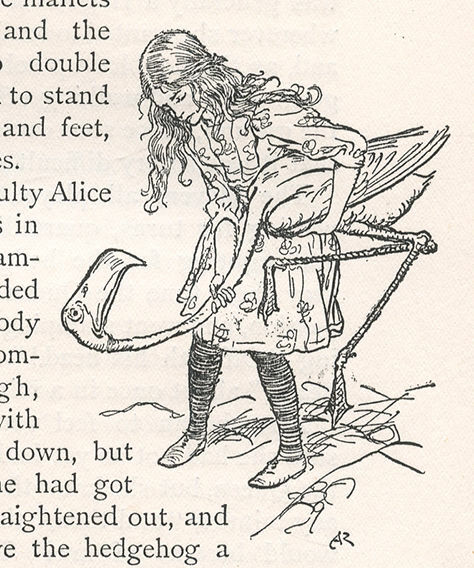 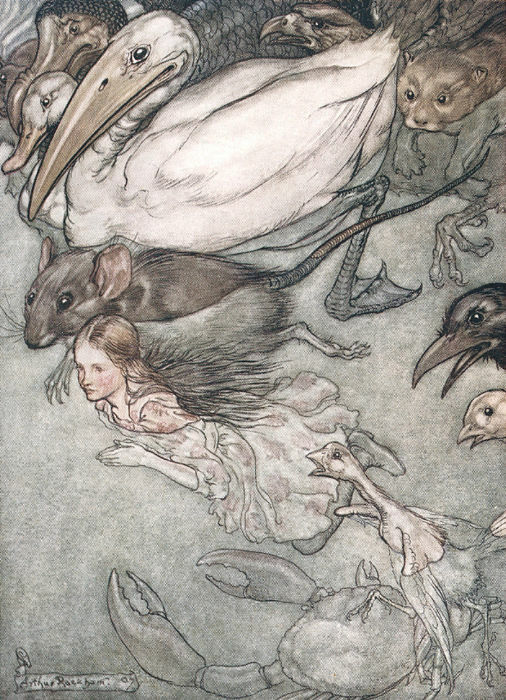 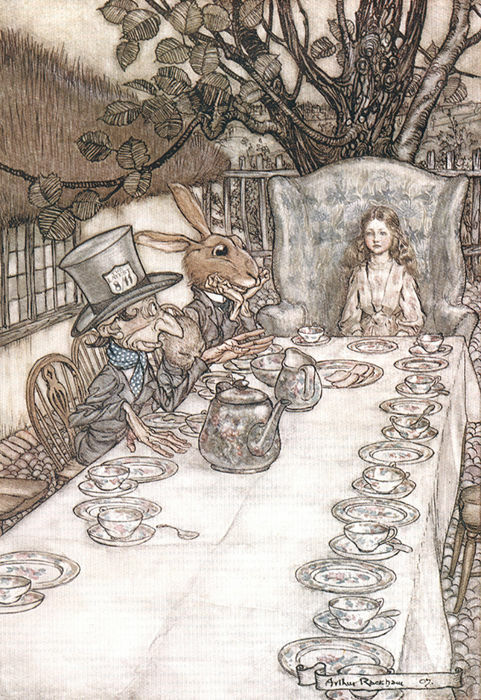 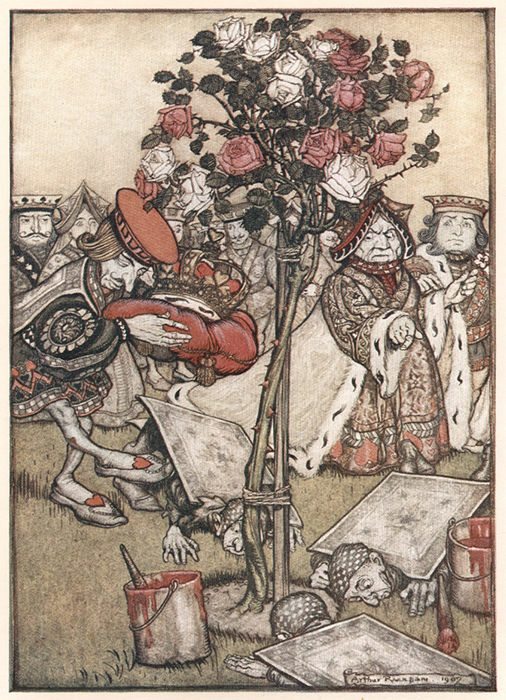 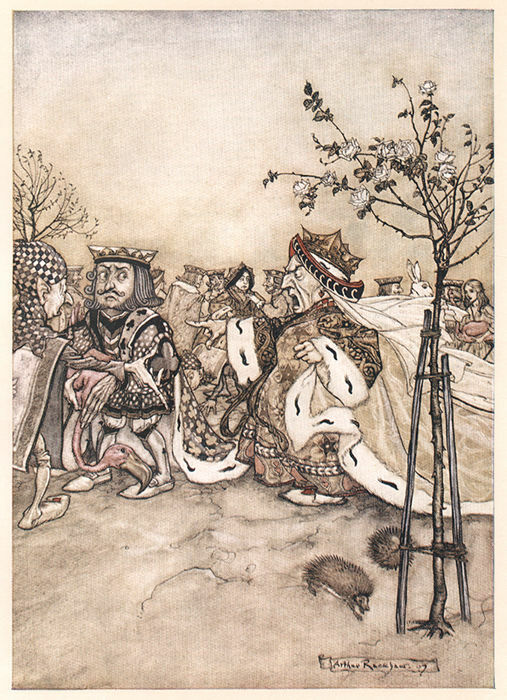 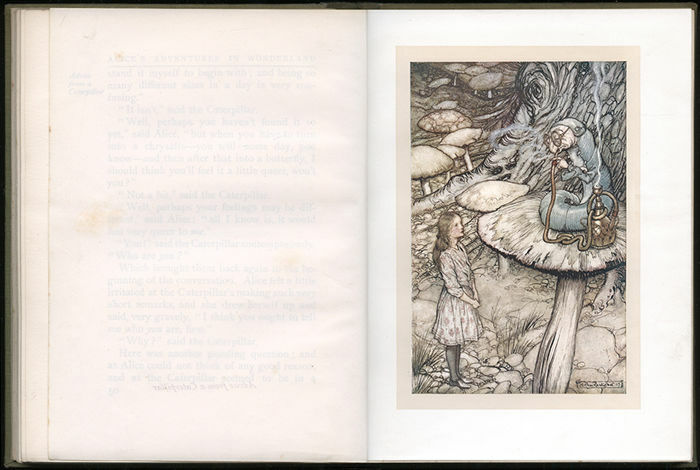 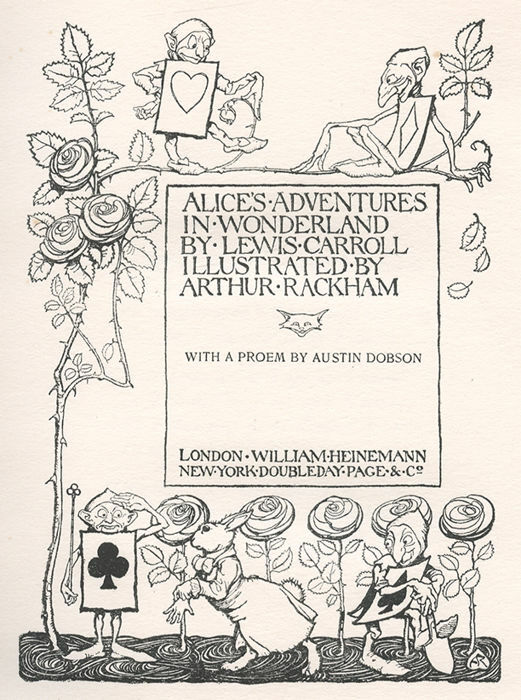 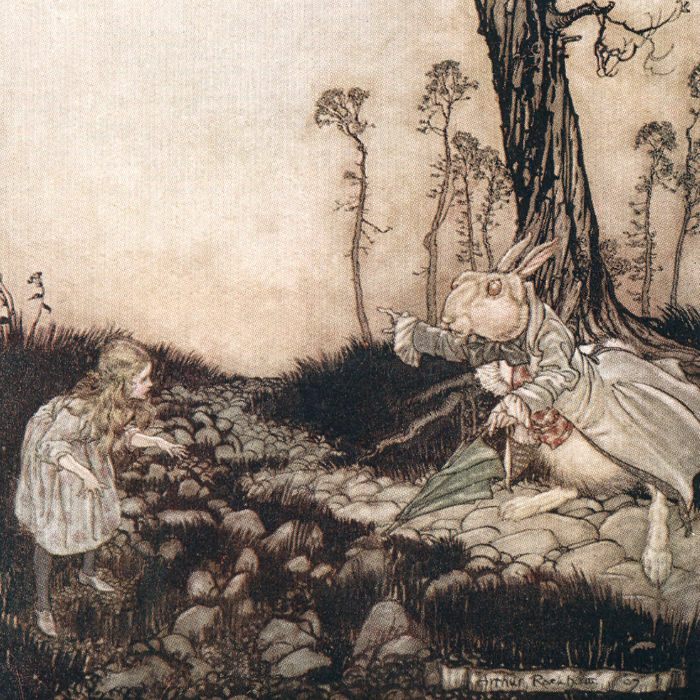 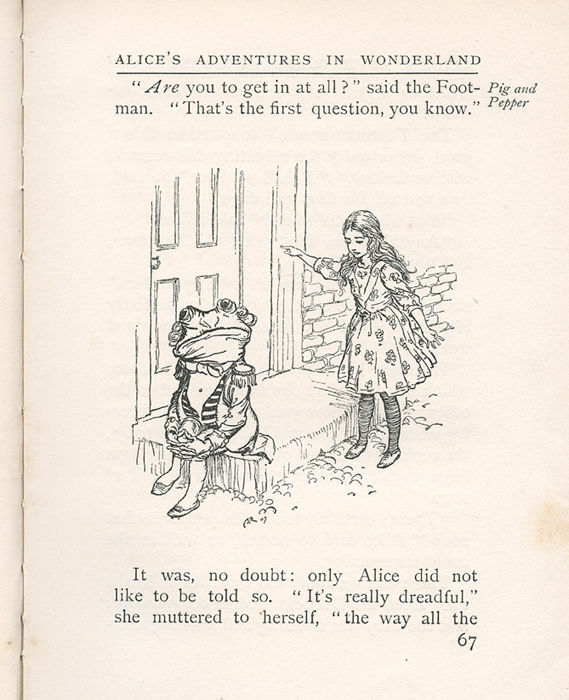 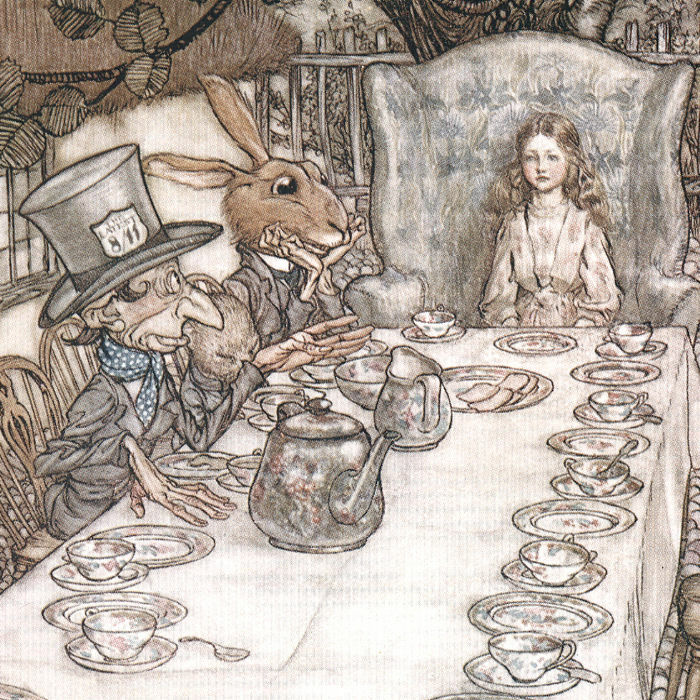 Arthur Rackham’s version of ‘Alice in Wonderland’ remains one of his most famous and best-loved works. 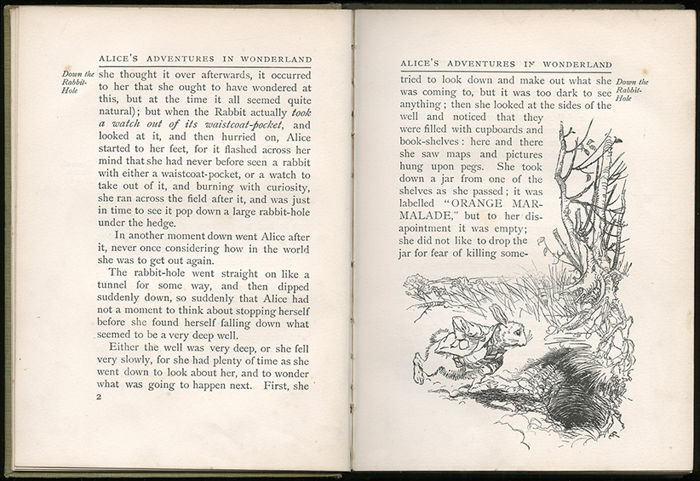 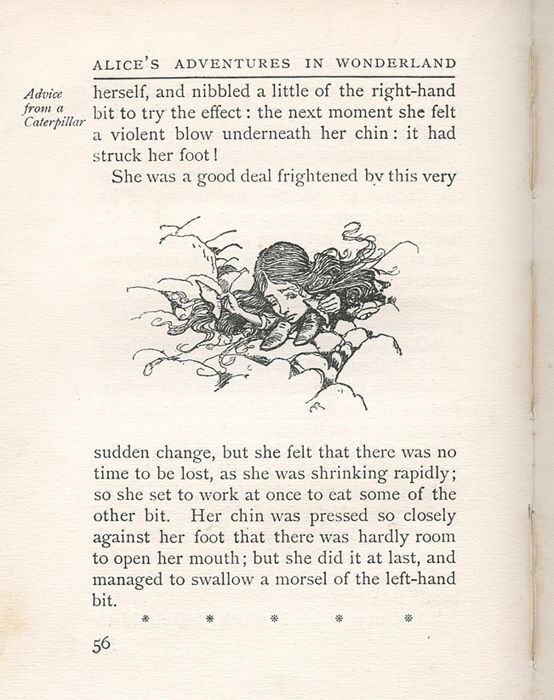 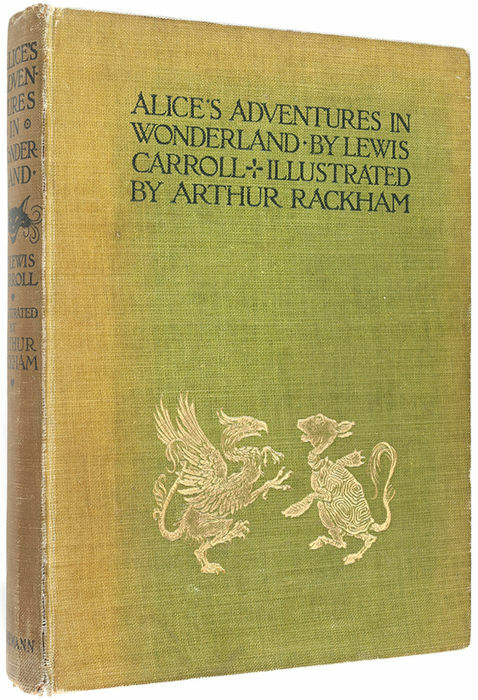 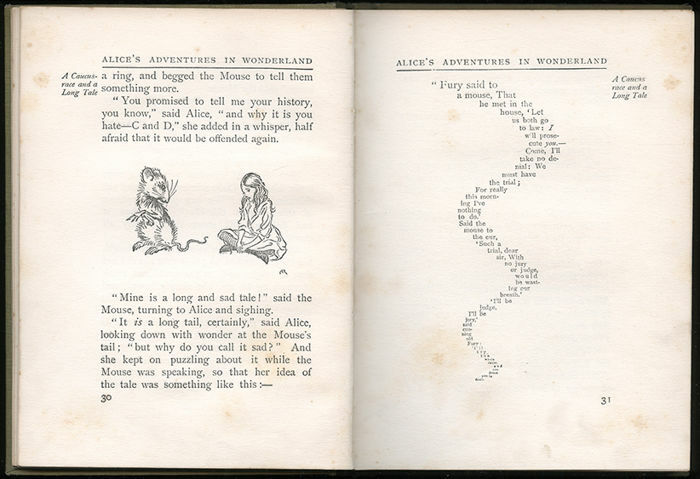 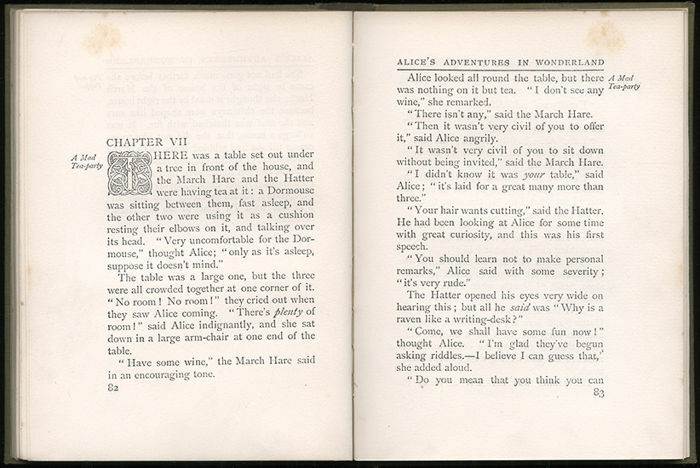 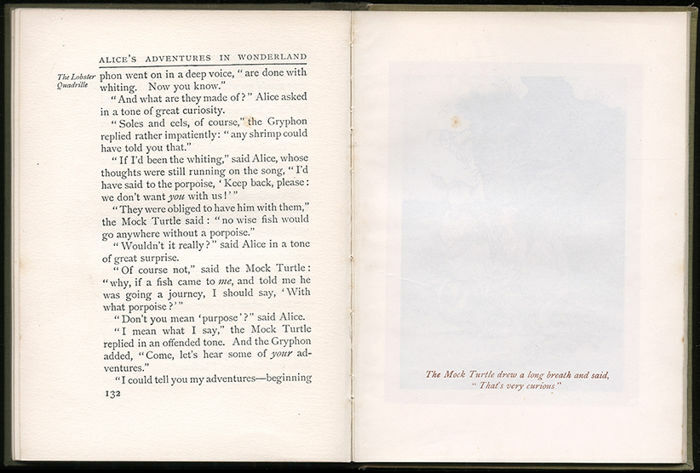 Featuring 13 beautiful colour plates, it was first published in 1907, the year in which the original copyright in Lewis Carroll’s book expired. 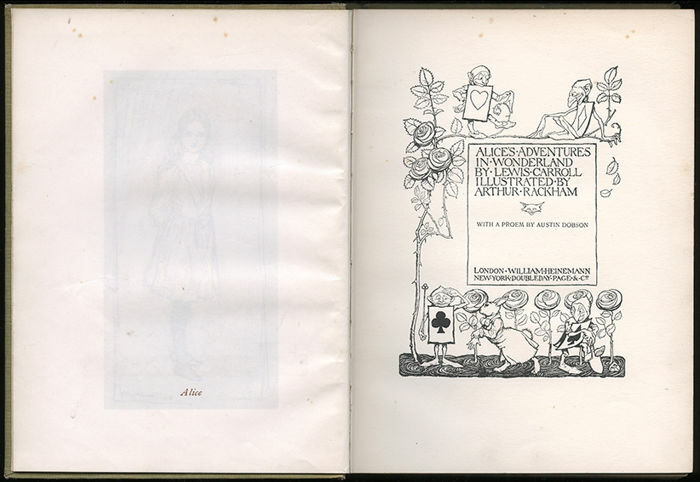 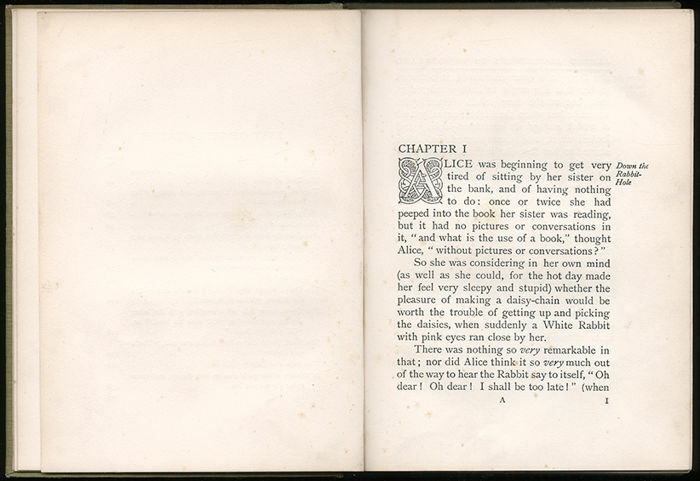 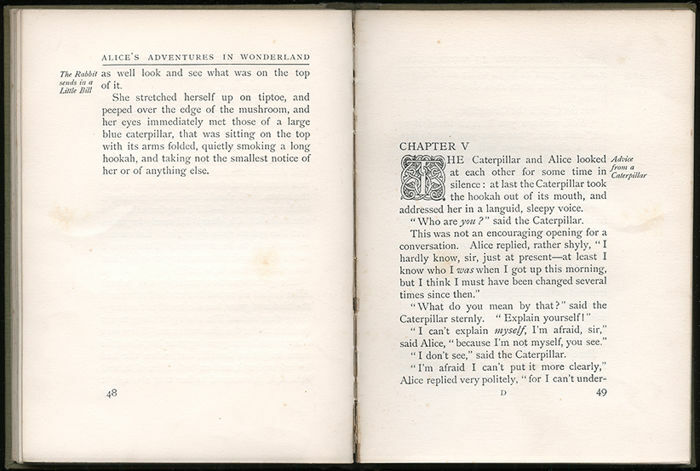 This is the true first trade edition as described by Riall, with the advertisement for ‘Rip Van Winkle’ to the reverse of the half-title page, and the advertisement for Pamela Tennant’s ‘The Children & the Pictures’ at the back of the book. 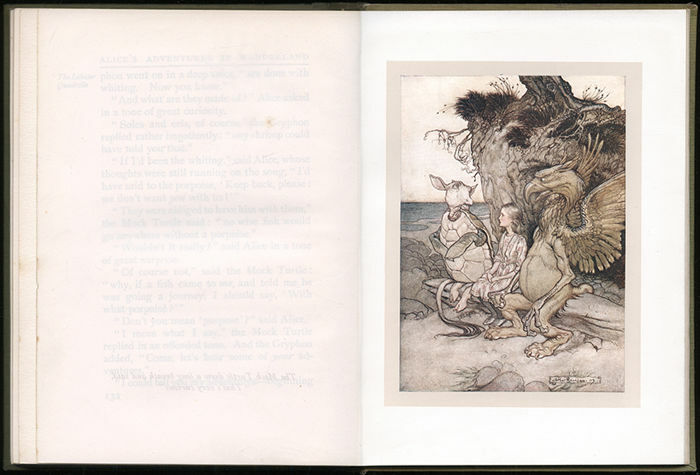 Note that pages 33-48 in this particular copy are duplicated, with an extra (duplicate) colour plate as a result (there are 14 plates instead of the usual 13). 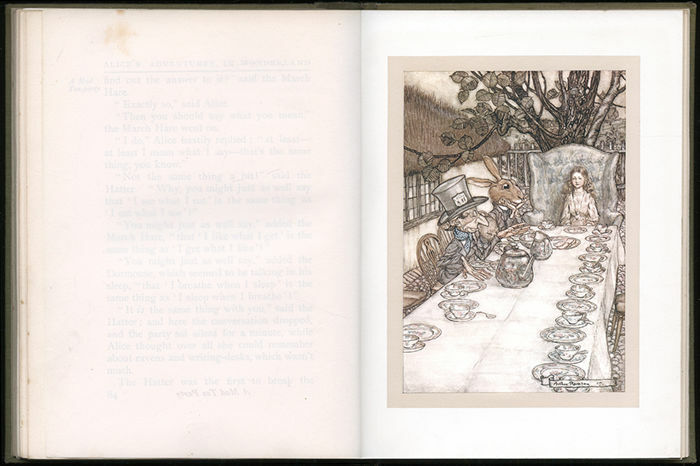 Usual age-toning to paper, a little finger-marking/smudging, seven pairs of gatherings stretched, three or four plates previously loose (now re-glued), foxing throughout (plates not affected), slight wear to a few lower edges. 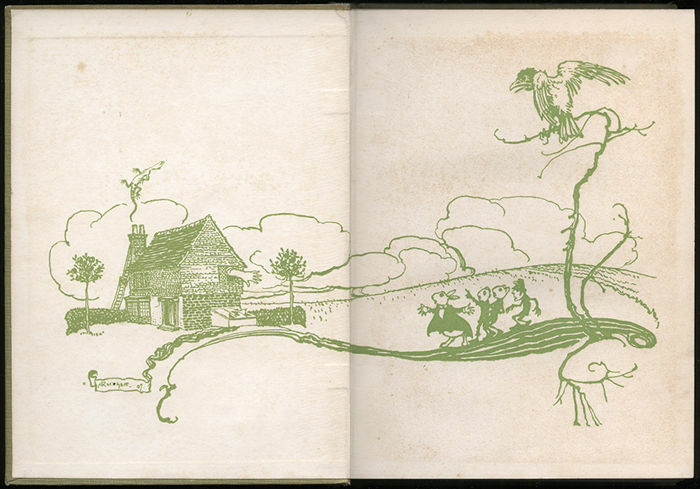 Endpapers with usual offsetting/foxing. 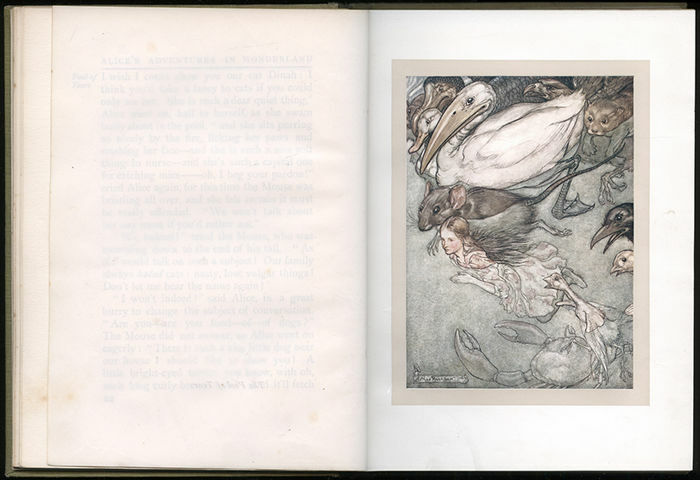 Edges of page block with foxing; top with a little loss to colour. 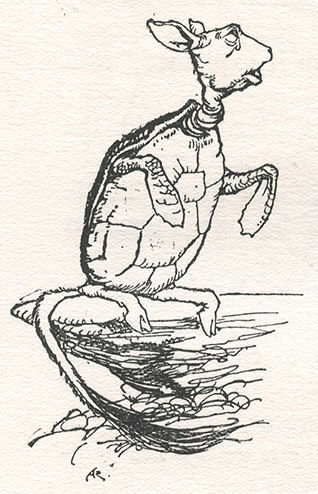 Binding loose, with slight lean. 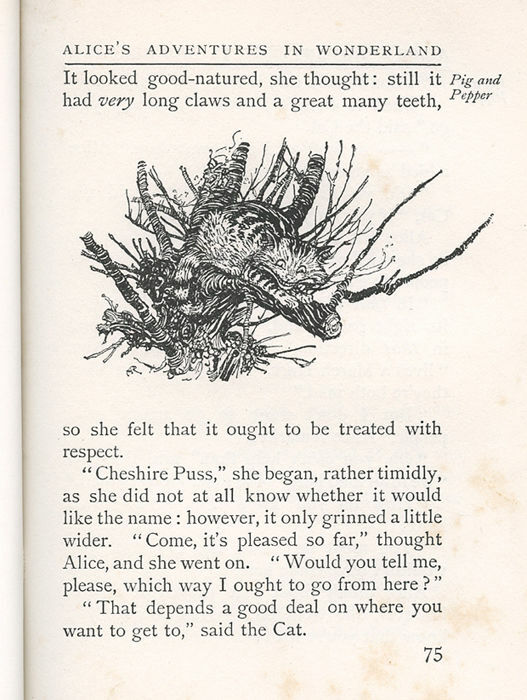 Boards and spine with discoloration and marks as shown, usual bumping, rubbing and wear to extremities; spine with glue-repaired tear across top, chipping to foot; upper and lower joints with four closed tears, each approximately 3 cm in length (partly glue repaired). 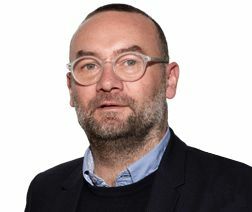 Entrega em excelentes condições. 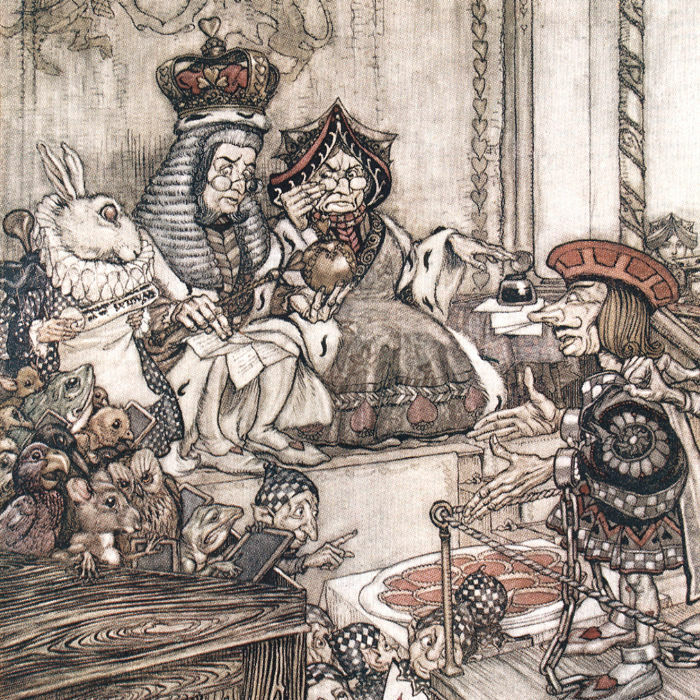 Encomenda bem acondicionada. 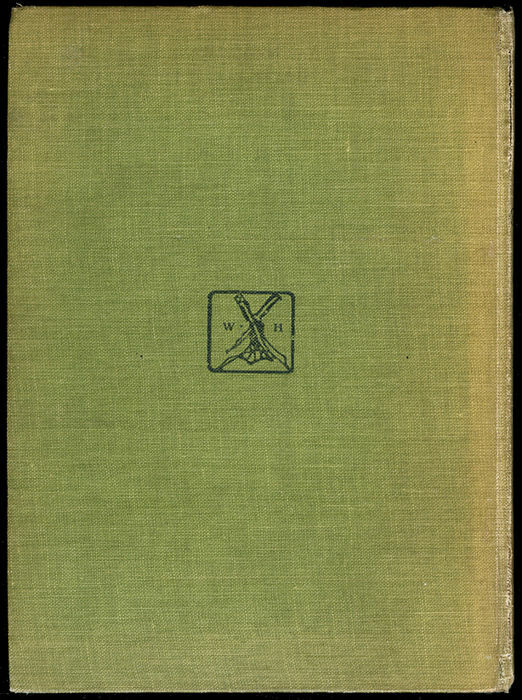 Livro correspondeu ao esperado.